For sophisticated clients there is a feasible opportunity to buy (including anonymously) and keep precius metalsin the larget in the largest repositories of precious metals in countries such as Switzerland, Austria, Australia, etc. Law & Trust International gives any customer and opporunity to invest in gold, silver, platinum and other metals and store it in the licenced srage facilities in Germany, Switzerland and Australia. Our company partners guarantee their ransom from our customers at maximally market prices. At all times, precious metals particularly gold was for the people one of the most important and reliable means of maintaining savings. And even now, in such a rapidly changing world with its hypertrophied financial system, where investors, speculators and manufacturers sometimes get lost in the abundance of investment instruments, precious metals, despite everything, continue to be in huge demand. 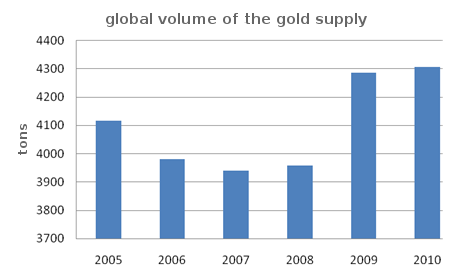 Thus, in mid April 2011 gold prices on the world market overcame milestone. For the First time in the history of the modern markets price of troy ounce (31.3 g) of yellow precious metal topped $ 1,500 mark. At the same time, a similar price dynamics does not cause any surprise. Most managers believe that it is needed to have their assets in gold metal that can significantly improve the performance of "risk -return profile." Such a privileged position of gold is conditioned by several reasons, most of which boils down to "protective" properties of the asset. So, traditionally, gold is the most effective tool to hedge against inflation risks in long-term investments. No less important characteristic of the precious metal is its low correlation with other financial assets. In other words, the dynamics of gold is less susceptible to general market influences. The latter is particularly clearly demonstrated during the acute phase of the current crisis, when the general slowing in the stock and commodity indicators "golden" quotes demonstrated systematic growth. Finally, buying precious metals allows to insure against varioations of the foreign exchange market, in particular, against excessive weakening of the dollar, which after the crisis of the Bretton Woods system actually took over the global money originally belonged to the golden metal. But in recent years the U.S. currency ceased to reliably cope with the role assigned to it, and once again came to the forefront of gold as a trusted indicator of universal measure of value. Described advantages are typical for gold as an investment asset, but besides that, is still considered a precious metal and a traditional exchange-traded commodity having its own specific properties. In this section the main advantage of physical gold is no credit risk inherent in other financial assets. Gold as a commodity - unlike securities or currencies, is no someone's commitment, which is especially important in the current economic realities, where the effectiveness of the current global financial and credit paradigm is being questioned. As a result, demand for gold is stable and under normal functioning of financial markets during political and economic convulsions. Like any asset, the price of gold is influenced by supply and demand dynamics in the market. At the same time, over the last decade the structure of buyers and sellers of precious metals has undergone significant change. Contribution of jewelers in total demand today is just over 50%. 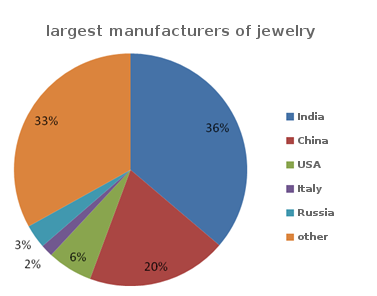 India, Chian, USA and Russia may be the main consumers of gold for jewelry productionto. The Indians and Chinese are the largest buyers of gold jewelry that is caused by religious and socio-cultural features of these countries.